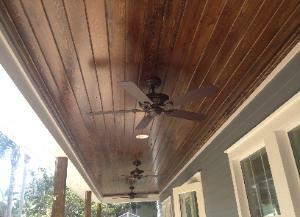 Ceilings are the largest unused surfaces in your home and a perfect place to add architectural details. Ceiling details include features such as coffers, trays, medallions, panels and domes. Coffered ceilings are paneled ceilings that not only serve as a decorative motif but also change the feeling and dimension of the room, as well as help reduce noise. Why not add a little sophistication to your home? 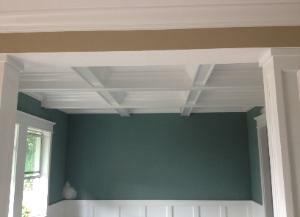 Often time’s coffered ceilings can be found in home libraries, dens, and offices; however, they are becoming more popular in kitchens, dining rooms, and living rooms as well. Room dimension can often be enhanced and altered with a coffered ceiling. Dark colors with deep recessed paneling can make a large room with high ceilings feel warm and smaller. Light colors, small recession and color variation between beam and panel can give an illusion of more space. downward rather than recessed, can call attention to an object such as a range hood or a pot rack. Ceiling Panels may be made from open-cell melamine based foam, or from formed thermoplastic. A wide range of raised patterns and colors is available for ceiling panels. These include, for example, themed sporting patterns for recreation rooms. the ceiling during construction and the chandelier’s chain would be installed at a later date. Modern homes may still feature a ceiling dome or two, especially in foyers and dining rooms where electric chandeliers are found. A recessed ceiling dome can be installed during construction, while other ceiling dome designs allow for surface installation. For the ultimate ceiling dome experience, some designers eliminate the chandelier entirely and create entire skylines or copies of famous paintings inside the dome itself. Ceiling medallions are reminiscent of those crafted long ago. With the highest degree of quality and detail, medallions are used to create a sense of ambiance and atmosphere. Most often they adorn chandeliers in entry ways, dining rooms, banquet halls and ceiling fan decorations. In adding that special charm, many are simply placed on a ceiling or wall as decoration. For more information including ideas and suggestions for your ceiling, contact Gloger Construction today.